Then you try and play it, and turns out it’s not as straightforward as it sounds. While the chords aren’t too hard to work out on the fretboard, the time signature is a different story. It can be challenging to comp in 5/4, such as you do with Take 5. But, by breaking down the rhythm into 3+2 quarter notes, working things slowly, and building up to the full tune, you’ll be jamming on this classic Dave Brubeck Quartet tune in no time. While counting 5/4 time will be hard to navigate at first, you can break down the bar into two smaller sections to make it easier to count when comping over Take 5. When doing so, you will break down 5/4 time into 3/4+2/4. Not only will this make it easier to count 5/4 time, it will also help you nail the Take 5 groove, as the tune is divided into the 3+2 rhythm in its construction. Now that you know how to count Take 5, 3+2 beats, you can begin to apply this knowledge to the chords themselves, starting with the A section. The first example will help you get used to the 3+2 rhythm, as you play 3 quarter notes over Ebm and 2 quarter notes over Bbm7. Go slow with this exercise, work it away from a metronome and tap your foot at first, then bring in the metronome when you feel ready. Again, go slow, count, and work up to the metronome in your practicing. Now you’re ready for the full Take 5 groove. Though you’ve probably heard this tune a thousand times, getting a smooth 5/4 groove on these changes isn’t as easy as it sounds. But, with time and a bit of practice, you’ll be nailing Take 5 in no time. As the bridge has more chord changes, it can prove an extra challenge to comp over on guitar. To help make the bridge easier, you can extract it from the full tune, work it until it’s smooth, and then pop it back into the full tune again. Here is the bridge rhythm, played as close to the original recording as possible on guitar. Now that you have broken down the 5/4 time signature into 3+2 beats, and applied it to the individual sections of Take 5, here is the full tune to work out. To keep things on one page, I’ve used “D.C. al fine” to repeat back to the beginning and repeat the first 8 bars. After you’ve worked out the original groove study, you can move on to a more advanced comping study over Take 5. This study uses syncopation, playing on the off beats, and will challenge your sense of time and form as you work it through the tune. Adding syncopation to 5/4 time can be tricky at first, but once you get it, it will add a whole new level of interest to your comping. And remember, if you get stuck, count! I’ve Paul Desmond’s solo written out! George Benson also did a version, but that’s an interpretation. I would be interested to hear and/or play your transcription. Where do we go from here ? andy, just returned from a holiday. I saw your reply. I will try to make a pdf of my transcription, which is handwritten, but you’ll see the fingerings! It’s handwritten, but I can make a pdf of it. By the way, my excuses for the late reply. Let me know if you’re still interested! Take Five was a hit of the Dave Brubeck Quartet in the 1959 LP Time Out. Although the piano groove in 5/4 may well be the offspring of Dave Brubeck’s mind, the tune was actually written by the alto-saxophonist and member of group Paul Desmond. Thanks for this 5/4 piece Matt & Dirk , it’s probably the most troublesome tune i have encountered, along with Straight No Chaser ! I will study this great example I take my hat off to the players who can render this with ease. Try the forums on this website. Thanks for breaking this down. I don’t plan on doing the syncopated version anytime soon. Dirk you’re the man!!!! For people like me who’s intrigued by jazz music I gotta give to you!! Fantastic job!! You’re a jazz guitarist’s lifesaver!!! Keep the jazz guitar going!!!! I’ve played this tune on (? )piano when I was a kid, on guitar as a teenie and now I spend time playing a 5/4 rhythm on the drums. I’ve heard Dave Brubeck the last time he was in Stuttgart/Germany – an old man until he sat down in front of the piano. Paul Desmond covers it all: a real hook melody, rhythm and feel. This is jazz – not noodling. Hey just click print screen and it’ll print for you. Some browsers will also let you save as PDF from print screen as well. It’s a wonderful lesson but hell on earth on a nylon string classical guitar! Perhaps this is my excuse to go get yet another axe? Oh, the wife will be thrilled! I downloaded this lesson 3 or 4 months ago and tried to learn it and gave up because it seemed too difficult for me at the time, but after learning your other chord comping studies on the standards,I breezed right through this lesson! I find it really strange that this lesson gave me so much trouble before and now I got it memorized in less than an hour.I’m now ready for the Take Five licks lesson you recently posted.Thank you so much for these awesome lessons and keep up the good work. 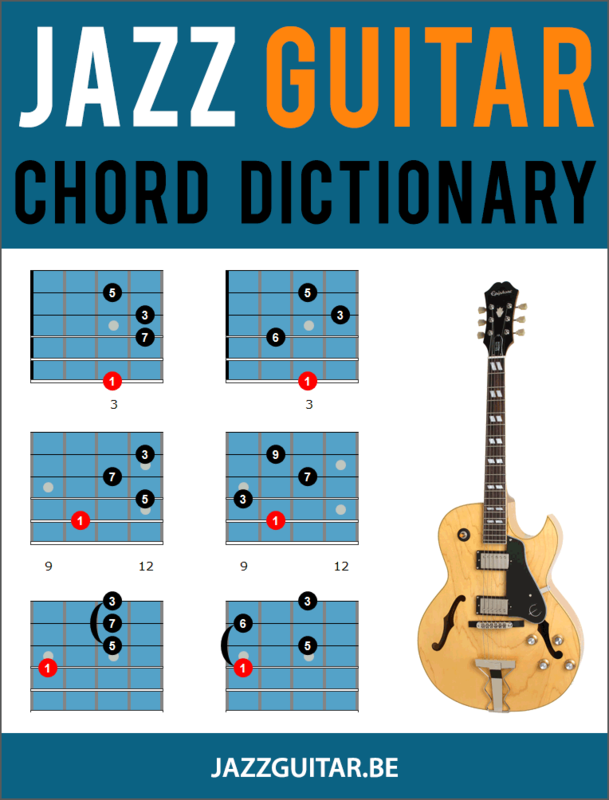 Hey, Milkmannnv, which other chord comping studies are you referring to, on this site ? Hello,Some of them are,There will never be another you,Stella by Starlight,both older lessons with video demo’s.The newer ones are Misty,Summertime,Georgia,Besame mucho,Satin doll,Autumn leaves,Blue bossa,Jazz blues in G,Take the A train,and a few others,all have sound files so you can hear how they go,they are described as chord studies, chord melody or comping lessons. Some are listed at the top right side of this page and others can be found as links once you click on the ones listed on this page.They are all here on this great site and very informative,you just have to take some time and look for them,I almost forget, I commented on a lot of them,so you can type in milkmannnv and that should lead you to most of the lessons I’m referring to,hope that helps you locate them. Oh yeah,there is also comping lessons on Killer Joe and On green dolphin street,I personally learned them note for note and am now coming up with rhythmic and chord inversion variations,lots of fun and info packed lessons,got to go to work,have fun with these cool lessons. Great tune! And great lesson! I think that in the “Original Groove” notation, the E notes in the Abm7 chords need to be flatted as they are earlier in the lesson. OR else there’s something jazzy going on that I don’t understand.